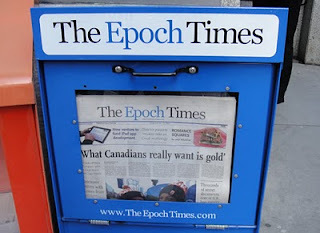 It is with great excitement and pleasure that I announce becoming a contributor to the Epoch Times online newspaper. They reached out to me to become one of their contributing bloggers. It is an honor to be asked and wonderful to be able to broaden my reach in my commitment to sharing the journey of living a healthier lifestyle with others. The first post was this past Sunday. You can find me in the "Life" section. I will be posting on Sundays and Wednesdays in the morning. Please check it out. Below is a link to the new EpochTimes.com blog. The Epoch Times has an interesting history and a great mission. This is how they started "Having witnessed events like Tiananmen Square and the persecution of the spiritual group Falun Gong, and at a great risk to themselves and their loved ones, a group of Chinese-Americans started publishing The Epoch Times in the Chinese language in the U.S. Some reporters in China were jailed, and some suffered severe torture." This is their Mission- "The Epoch Times is an independent voice in print and on the web. We report news responsibly and truthfully so that readers can improve their own lives and increase their understanding and respect for their neighbors next door and around the globe. In our approach and in our content, we uphold universal human values, rights, and freedoms. We are a business that puts our readers’ interests first, in all that we do." You might just want to subscribe!